On government surveillance and Wall Street accountability, the nominee for FBI director has a lot to answer for. President Obama is prepared to nominate James Comey, a former Department of Justice official under George W. Bush, to head the FBI, according to various press reports. Comey’s confirmation hearings before the Senate Judiciary Committee will present an excellent opportunity to press the administration on two of its biggest failings: an out-of-control security state and a dearth of prosecutions related to the 2008 crash on Wall Street. Luckily, senators seem ready to ask these questions—and fundamental changes to White House policy are possible if they push hard enough. Quite a bit of attention has already been paid to Comey’s role in warrantless surveillance by the federal government, which expanded dramatically while he was at the Justice Department. 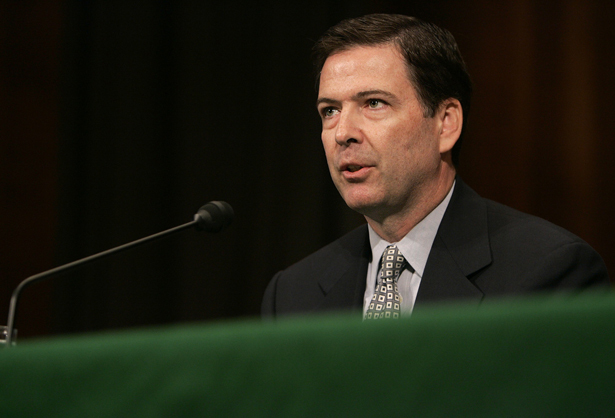 Specifically, we’ve repeatedly heard how Comey, along with then–Attorney General John Ashcroft and current FBI Director Robert Mueller, stood up to Bush and then–White House counsel Alberto Gonzales over their warrantless surveillance of Americans. The men threatened to resign en masse if Bush didn’t scale back that program. So Comey was essentially on board with federal surveillance outside the FISA court system, just not this particular abuse of it—and as Glenn Greenwald points out in an excellent column, Comey was actually one of the ones who authorized warrantless surveillance in the first place. This should be disqualifying for the top law enforcement officer in the land. But at the very least, it presents very fertile territory for senators on the intelligence committee to press Comey, and by extension the administration, on the propriety of federal surveillance, which is no doubt continuing with dubious legal justification. We believe most Americans would be stunned to learn the details of how these secret court opinions have interpreted section 215 of the Patriot Act. As we see it, there is now a significant gap between what most Americans think the law allows and what the government secretly claims the law allows. This is a problem, because it is impossible to have an informed public debate about what the law should say when the public doesn’t know what its government thinks the law says. A loose interpretation of Section 215 could allow the government to collect all of our third-party information: meaning our bank accounts, library records, public transit movements, Internet activity, and so on. Is that what it’s doing? Nobody knows. Wyden and Udall pressed this issue when Obama wanted to extend Mueller’s term two years ago, and could make a huge issue with Comey, especially given his checkered past in Bush’s Department of Justice. Real pressure could lead to changes, or at least more transparency, as demonstrated earlier this year when Wyden went after John Brennan aggressively over the government’s targeted killing program when Brennan was nominated to head the CIA. During the nomination process, Wyden successfully got the administration to release the secret legal justifications for the drone program, albeit only to members of the committee, and the entire episode no doubt elevated public awareness—and concern—over drones. Obama gave a lengthy defense of his policy this month and promised to scale back the use of drones. There is substantial reason to be skeptical of these promises, and the administration reaction still leaves a lot to be desired, but Wyden certainly helped move the needle. Meanwhile, Comey’s nomination hearings are a great venue to press the administration on its failure to hold big financial firms accountable for demonstrable misconduct leading up to the 2008 collapse. [I]f he’s nominated, he would have to answer questions about his recent work in the hedge fund industry. The administration’s efforts to criminally prosecute Wall Street for its part in the economic downturn have been abysmal, and his agency would have to help build the case against some of his colleagues in this lucrative industry. One could make the strong case that Comey’s background should disqualify him from leading the FBI, but that’s not likely given his presumed support from both Republicans and administration-friendly Democrats. At the very least, however, concerned senators should be ready to make some noise.